When you have a high volume job, Image3D PopUp viewers let you communicate in super-amazing 3D at a lower cost per unit than our classic or mini viewers. Designed flat for easy mailing, they expand (pop up!) when opened. Great for large scale direct mail campaigns targeting thousands. Minimum 5,000 with per-unit discounts for higher volumes. Four full color 3D images included with each viewer. Slides are created using your 2D images that we convert to 3D, or original 3D photography shot by our photographers. Printing for exterior and interior of PopUps is included. Can be designed as a self-mailer or as an insert in a 5x7 envelope. graphics for exterior and interior of viewer. We can ship 5,000 to 50,000 in 6 weeks. Larger quantities require additional time and will be quoted on request. 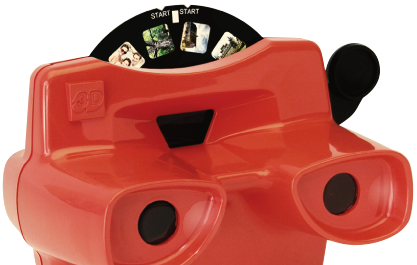 And like all other Image3D products our 3D PopUp Viewer is made entirely in the USA and is recyclable.